I’ve never really been a hat guy. Even in freezing weather, you’ll rarely catch me in a skull cap. I’m not even a fan of facemasks when I’m skiing. But when it comes to hunting, all that changes. Headgear is the first item on my pre-hunt checklist. Hats and other headgear can make big differences in a lot of different aspects of hunting. They come into play with everything from warmth to scent control. If you’ve never put much thought into what you’re putting on your head, read through our guide to see what you need and why. Afterwards you can look through our list of the best of the best to find the ideal setup for you. A ball cap is just that–the standard baseball cap design with a bill that shades your eyes. You can get them in camo patterns for hunting. Since these caps come down right above your ears, they aren’t really cold-weather gear. In fact, they’re ideal for those hot early-season days when you need to shade your eyes from the sun to get a good shot. Many even have ventilation holes to keep your head cool. Skull caps don’t have bills, but they do come down over your ears. They’re usually made of warm, flexible material so they fit snugly and insulate your head. It also means you can combine them with a ball cap if you want shade. They’re also light and easy to pack. If you get hot and need to take it off, it’s no problem to store away. There are a couple different kinds of brimmed hats. All of them protect you from a wide range of elements. Traditional cowboy hats feature wide brims that offer 360-degree sun protection. They’re usually waxed and oiled which makes them waterproof, too. That means the brim also serves as an umbrella to keep you dry. Boonie hats were designed by the military for jungle warfare. They have great sun protection but have ventilation that keeps you cool. Unlike cowboy hats, they usually come in camo. Both are great options for long overnight hunts when the weather could change suddenly and you’re exposed to the elements without secure shelter. You might consider adding a facemask to your ensemble for a few different reasons. For one, they keep your face warm. The cold dries your lips and makes your nose run and a ton of other things that aren’t really fun. Perhaps more importantly, your face is a big piece of skin that can spook a deer if it moves. If you want complete camouflage, you have to use a facemask. A balaclava is basically another name for a ski mask. Like the Russian-sounding name suggests, they’re primarily cold-weather gear. British troops designed them during the Crimean War. A big plus of balaclavas is their versatility. They can be worn numerous different ways, over the head, neck or entire face. There are several styles of hats made for cold weather. In the end what really makes the hat you choose is the material. As you might expect, thin material doesn’t insulate as well as thicker material, but it can be good against the wind. Wool and polyester can be really warm, but when it comes to insulation, nothing beats real fur. There’s a reason animals grow it after all. It only takes one winter hunt to learn that any coat and hat combination will still inevitably expose your neck. You move it too much. 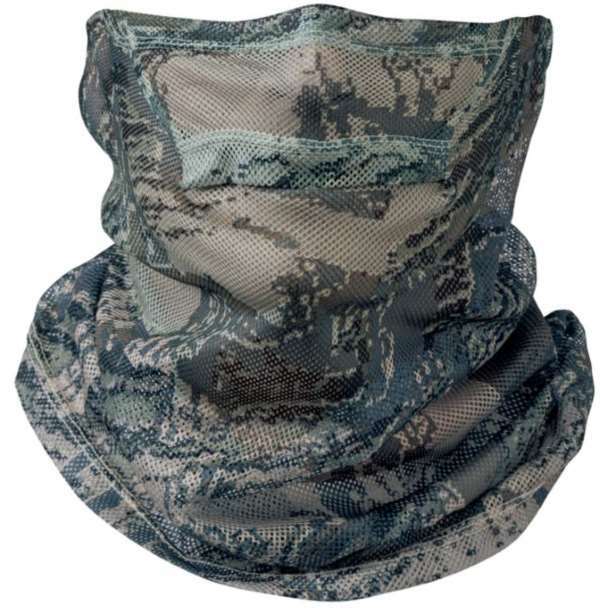 Neck gaiters function like scarves to keep your neck warm and protected from the wind. They’re just more compact. Plus, you can get them in camo. When it comes to headgear, you really have to consider your environment and the temperatures you’ll be facing. Even if you’re hunting cold winter mornings, the afternoon sun might make you sweat. If that’s the case, you want something breathable. Cotton is a great option for hot, humid weather. Thick, waterproof materials like Gore-Tex keep you really warm, but they also trap in your sweat. Not only can this be uncomfortable, sweat is one of the biggest factor in your scent. Before you go this route, make sure it’s going to be cold enough for you to really need it. Few things ruin a hunt faster than getting wet. It makes you cold and just all around puts you in a bad mood. If you expect a lot of rain this hunting season, it’s worth it to find waterproof gear, hats included. A lot of synthetic fabrics accomplish this. You can also find cotton hats that have been waxed to prevent them from absorbing water. If you’ve already got your other camo, don’t sweat it. Your gear doesn’t all need to match. Deer don’t care about fashion taboos. Your gear does have to match your surroundings, though. Pay attention to camo patterns and how well they fit your area. You don’t want any green if you hunt gray, dead winter forests in the Midwest. If you’re hunting in Florida, white is probably going to stand out any time of the year. There are also a lot of kinds of patterns. Digital military patterns, for example, have been rigorously researched, but for human eyes. Some companies do their own research to design camo that specifically hides you from the deer eye and makes your movements more difficult to spot. This is a big advantage. Heads can get sweaty, even in cold winter weather. Sweat smells and can spook game. When you’re looking for a hat, scent control is nothing to skimp on. Moisture-wicking fabric keeps you cool and dry. Some hats even feature innovative materials that trap and neutralize odor (more on that here). Here’s a cap that looks good anywhere, including the woods. It comes in a dozen different designs. That means you can get the perfect camo for your hunting area. You can even get black if you want to be invisible in the night or white if you hunt snowy areas. In a addition to camo design, you can choose between a wide variety of materials. You can get 100% cotton, 100% nylon or blends. This means you can optimize the hat for your personal situation. Cotton is highly breathable while nylon stretches and resists moisture. If you hunt in a humid area that gets hot during the day, a cotton cap can help keep you cool. If you’re expecting rain, consider nylon. For hunting, all the noisy Velcro is less than optimal, but it does let you decorate the cap as you see fit. There’s a patch for flags, military patches or other ways to express yourself. It’s adjustable and one size fits all. Plus, it has six ventilation holes, so it’s comfortable no matter the climate. If you’re looking for a cold-weather skull cap, this is an option you should check out. The fabric itself is warm, but the cap also features fleece ear covers. Your ears lose a lot of heat, so extra insulation there is essential. The inner layer of the cap also wicks moisture. Despite cold temperatures, you’ll probably sweat, and that can actually make you colder in the long run. The outer layer repels outside moisture too, so your head stays dry all around. Finally, if you know the ScentLok brand, you know about the Carbon Alloy technology. This is an innovative additive to the fabric that absorbs moisture and keeps you from giving off an odor that’ll spook your quarry. If you’ve got long hair that gets sweaty easily under a cap, this is really important. The ScentLok cap only comes in one size. This should fit most people, but if your skull is a little larger than most, beware. For everyone else, the stretch fabric keeps it snug and comfortable. This Sitka cap takes the gold for camo patterns. It’s a sleek design that combines both a symmetry-disrupting macropattern with a fractal-geometry-based micropattern. This combination is on the scientific cutting edge. If you’re a still hunter out in the open who needs to be as camouflaged as possible, you need something like this. The camo isn’t the only great feature, though. The material itself is a durable polyester that’s water resistant. It’s also breathable, so if you start sweating while you’re hiking around, you won’t overheat. Like a lot of hats, this one has a Velcro strap, which we’re not a fan of because it has the potential to make noise. It does mean you can fit the hat snugly to your head, though. 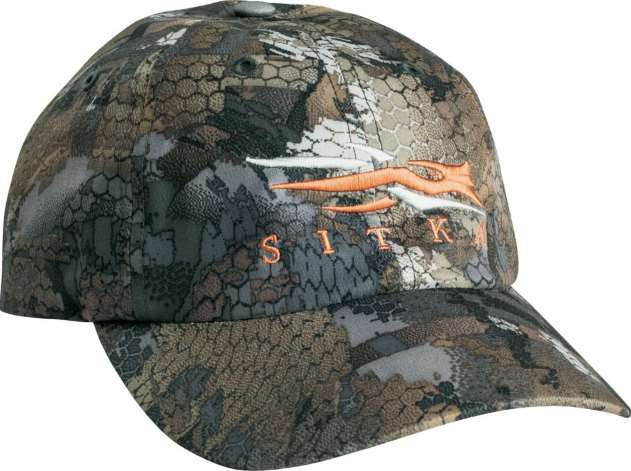 This on top of its lightweight design make it a comfortable hat for long hunts. 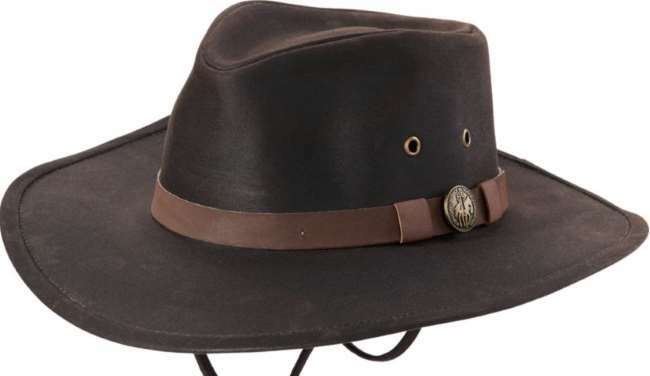 For those long wilderness hunts, you need a brimmed hat that’s more than just stylish. You need a hat that can protect you from the elements. The Kodiak offers 50 UPF protection and a wide 3¼ -inch brim, so your face stays out of the sun. It’s 100% cotton and has ventilation holes, so you won’t overheat. It also protects you from rain. It’s waxed and oiled to be waterproof. You can purchase the hat in four sizes from small to extra-large, so almost any hunter can find the right fit. It even has a leather chin strap to keep it as secure as possible–and so you don’t lose it in strong wind. This hat holds up in just about any weather you encounter. The Rothco Boonie Hat is military-style brimmed hat that you can get in a wide variety of patterns from standard ACU digital camo to pink. The material is cotton, and there are four screen ventilation holes. This keeps the hat cool and comfortable, all while protecting you from rain and sun. Something unique about this hat is the branch loops. This allows you to stick vegetation into the hat for maximum camouflage. When choosing a hat, keep in mind that these run small. There is a chin strap, so you can get a snug fit. Rotcho makes this boonie hat to government specifications. Boonie hats were designed for the Vietnam War and are specified for hot, humid and sunny weather. If that’s the kind of climate you hunt, consider a boonie hat. We’ve only got one balaclava on our list, and it’s a good one. Above all we love it for the Carbon Alloy technology that comes with all ScentLok products. This innovative fabric traps and neutralizes odors. Since it covers your entire face, you can be safe knowing all the oils and sweat from your head go unnoticed. The camo is striking and effective. 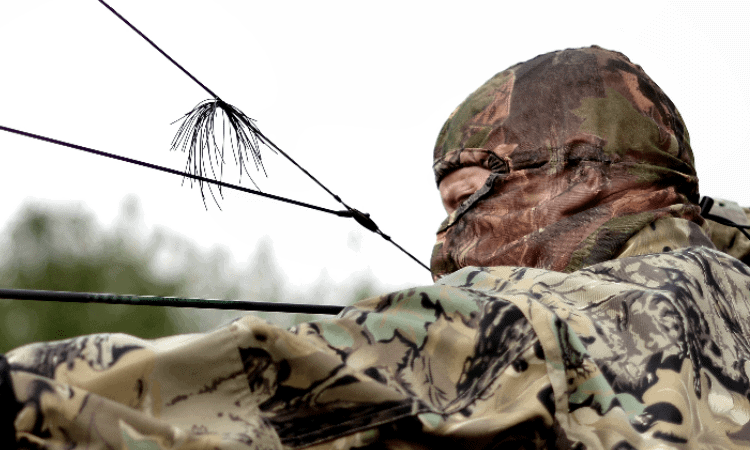 Bowhunters have to make a lot more movements, and just having your face exposed could spook game. Keeping your entire face covered with a good camo pattern is a great strategy. The Savanna headcover is super lightweight, so we recommend it for early season hunting when you might get hot. It makes a great addition to a layered outfit, and the hinged facemask easily comes down. This can let you breathe more easily if you’re moving, or use a call or just your phone. Despite the thin fabric, it’s also really durable. It’s a quality product at a great price. This facemask totally covers your face and neck leaving nothing exposed. You can breathe through the comfortable open-mesh polyester. This way you don’t spook any game with head movements, and you keep your neck warm too. You can choose between three camo patterns, including Concealment Subalpine which means it’s great for cold weather and mountainous terrain. Regardless of which pattern you go for, it protects your neck from cold, biting winds. Because of an elastic drawcord, it should fit almost anybody. The drawcord also keeps it secure on your head, which is a problem with a lot of other facemasks. Not only is this convenient, but it keeps the mask from getting in your way at just the wrong time. The only problem with the fit is that it rides a little high. If you have a small head, this might mean it gets in the way of your eyes. With this combo you can kill two birds with one stone–maybe even literally. It’s both a facemask and bucket hat that features three-dimensional lifelike camo. Not only are the fake leaves more realistic, but they make movement appear more natural, like leaves blowing in the wind. A benefit of the combination design is that the facemask hangs from the hat. This conceals the outline of your face which makes you even harder to spot. It’s also less likely to impair your hearing and sight. Since this is a combo, it comes at a slightly higher price, but you get a lot for that price. The hat and mask together offer 360-degree sun protection, and the moisture-wicking fabric keeps you dry. The hat is measured and fitted, so you can get the fit just right. The mask even tucks up into the hat which makes it more comfortable for moving around. Then once your in your stand, you can bring it down to completely conceal your face. 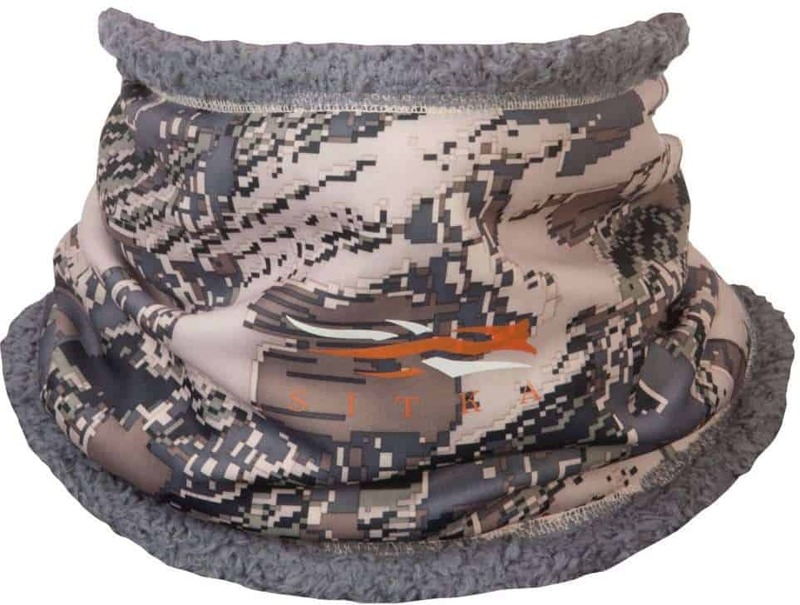 Sitka lands another item on our list with a neck gaiter that’s about as good as it gets for cold weather. Nothing is worse than bundling yourself up head to toe only to have the wind biting at your neck. Especially the wind that gets going high up in a tree stand. Double-thick high-pile fleece keeps your neck totally covered and insulated. It’s a four-way stretch material, so it fits comfortably and tight so no cold air can get through to your skin. The camo comes in two patterns, both pale digital designs that work great for snowy or rocky areas. It’s a good option for hunting in the mountains out West or during the gray winter of the South and Midwest. It makes a perfect addition to a thick winter hunting wardrobe.